"November is usually such a disagreeable month . . . as if the year had suddenly found out that she was growing old and could do nothing but weep and fret over it. This year is growing old gracefully . . . just like a stately old lady who know she can be charming even with grey hair and wrinkles. We've had lovely days and delicious twilights." Left without words to offer. Stormed in with only a whisper. As the sun and moon took their turns in the November sky she could only keep hunting in the storms. Groping her way to shelter. Day after day, weak ones begged for intercession. Storm after storm, weary ones cried out for sanctuary. Battle after battle, warriors appealed for peace. She tuned in for a song to be somewhere in the suffering. She watched for joy to come in the mourning. She waited for worship to follow the weeping. She shook her head at the things that could silence her. How the exhausting days, an off-handed comment, relentless struggles, winds of life whipping her in the face, darkest nights, and the depravity of her own soul could leave her hushed, scared, unsure of setting one foot in front of the other. Her default, to wrap herself in fear instead of walking in faith, threatened to deride her. But she had set out to hunt and although it looked different then she anticipated, in hunting, she opened her hand to God's grace, steadfast love and never-ending mercies, she released her grip on fear and she found refuge in the present suffering by seeing it in light of God's eternal promises. Yes, tears fall in the tiring days. Yes, strength fails in the storms of life. Yes, disease and death do sting. But as prayers are on the lips of the saints, the God who bottles our tears also gathers our prayers in golden bowls. As our weeping endures for the moment, we know the victory has been won, the Messiah has come in mortal flesh as a babe, conquered all sin and death as the God-man, so our prayers will be worship to the One who sits on the Throne. As our suffering must be seen in light of God's eternal promises, so our prayers will be made sweet incense when the worthy Lamb, who suffered once for sins, the righteous for the unrighteous, that he might bring us to God, opens the book and loosens the seals. God turns our wailing into dancing and our prayer into worship because, "behold, the Lion of the tribe of Judah, the Root of David, has conquered" and we will weep no more. When the world screams no God she yearns for more God. So she set out in an earnest search and called this month 'Morevember'. And she found that this hunting was just what she needed. to open her heart to hear. So even when she was dumb she was not without a hope. When her tears fell, she believed there would be a turning to joy. When prayers faltered on her lips, she presented only groanings and was confident the Spirit would plead on her behalf. With bold supplication she surrendered, knew her own weakness and found refuge. November grew old, and now passes on with a white gleaming crown. And the one who was silenced, now she silences the nay-sayers with a charm of her own. She gives thanks for the delicious twilights and the sunrise after the storm. For the Son in the midst of the storm. For the Rock who is her Refuge. She finds her song in the suffering. Her hope in the hurting. Her joy in the world. In Him. More of Him. In His presence. His goodness. His love. November wanted to fill her right to the deepest marrow with melancholy. But in the hunting, her ears were ripened to His music. His mercy. His grace. In the silence her heart heard His song. In the morning we wait for fullness of joy. This is the final post for this series of Hunting for more of God's Grace, Steadfast love and His Mercies that are new every morning in 'Morevember'. 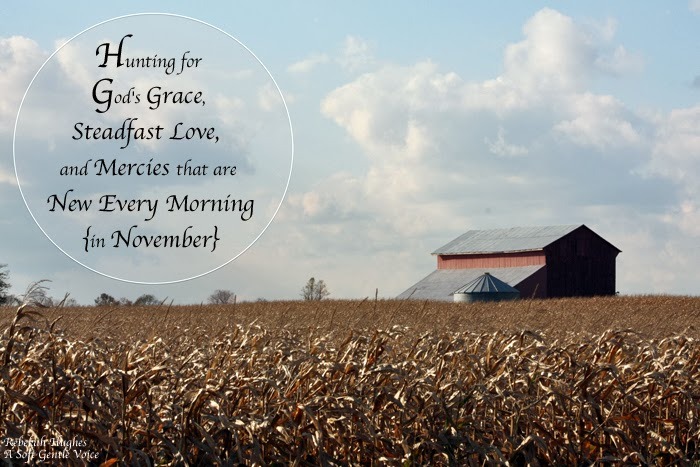 I invite you to never stop hunting along with me for more of His mercy and grace and steadfast love to see more of Him in #Morevember on Facebook and Twitter. Linking with Emily. What have you learned this month? Please share. Oh, such stunningly beautiful photos and words here. Morevember...love this! Here from Barbie's.